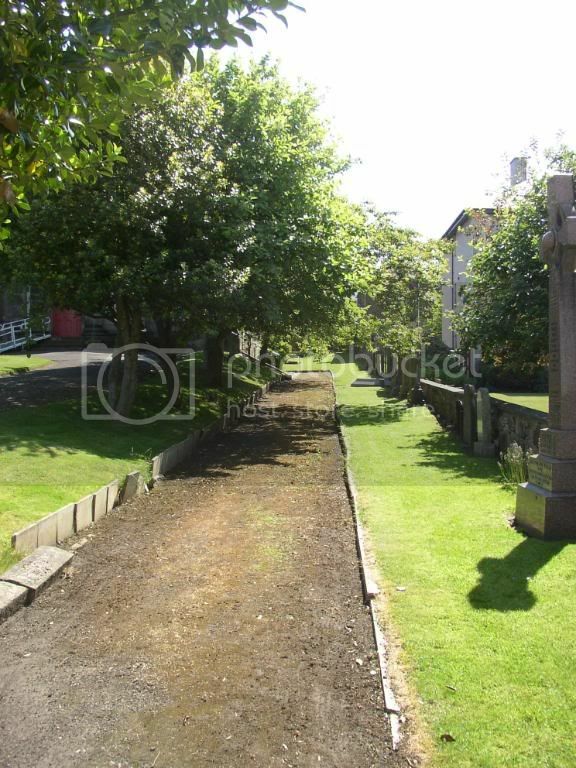 St Mark's Episcopal Church and Churchyard can be found in Portobello High Street. The farmland on which the church and grounds sit was feued from the Marquis of Abercorn in 1825 by the church founders Lieut Col Halyburton and his wife Eliza and James and Susannah Rutherford. 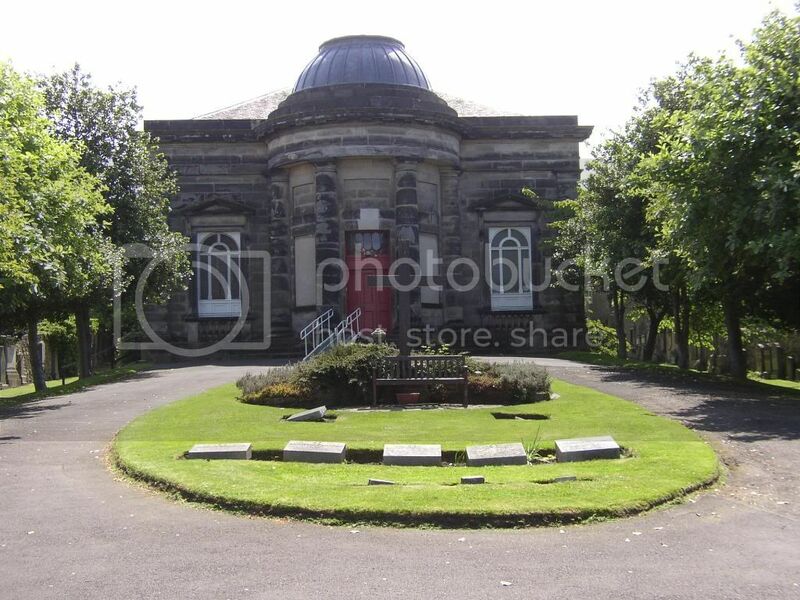 They rapidly had the ‘chapel’ erected at their own expense and it was opened in May 1828. 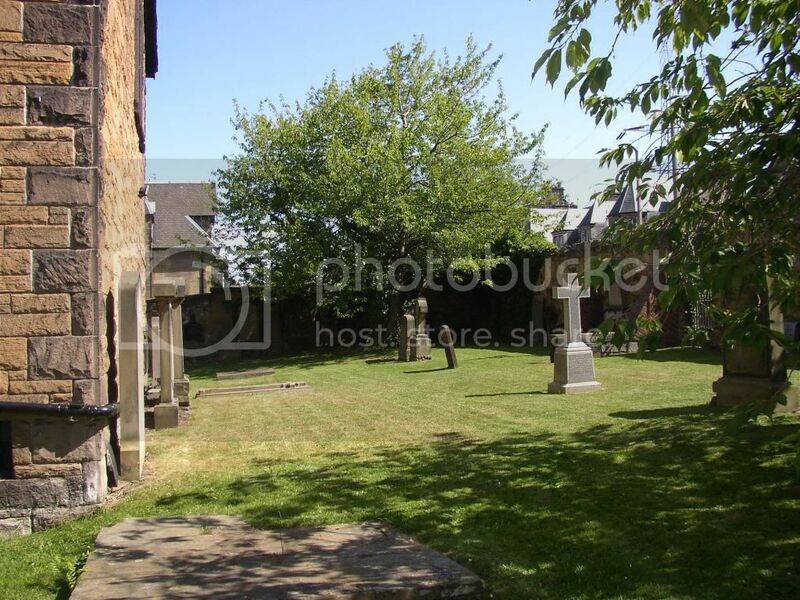 The Vestry soon sought the right to open a burying ground around the chapel, but became embroiled in a dispute with the owner of a neighbouring villa who insighted the Kirk Session of Duddingstone, who had also opened a burying ground, to engage in litigation with St Mark’s. The case was eventually decided in favour of St Mark’s and the burying ground was consecrated on 11 November 1828 by Bishop Sandford. The first recorded burial took place a month later. Lairs were either purchased or leased for periods of fourteen years after which the Vestry was entitled to make further use of any lair upon which the lease had not been renewed ‘and to cause all Tombstones, Monuments or Tablets placed thereon to be removed’! Purchasers were bound to ‘enclose their respective Lots with Boundary and Division Walls…At least six feet in depth below the surface’. The 1859 Lair Plan shows evidence these walls were erected, however nothing can be seen above ground today. Early management of the burial ground appears to have been chaotic. The first lair plan was lost and new plans made in 1859, however problems soon arose when lairs in the area immediately behind the church, which believed to be vacant, were found to be occupied. The problem proved to be so great that the Vestry prohibited all further internments in December 1862, except in Block C and the border on the east boundary wall. Unfortunately it ‘proved difficult to dispose of this ground, as no-one liked the position’. 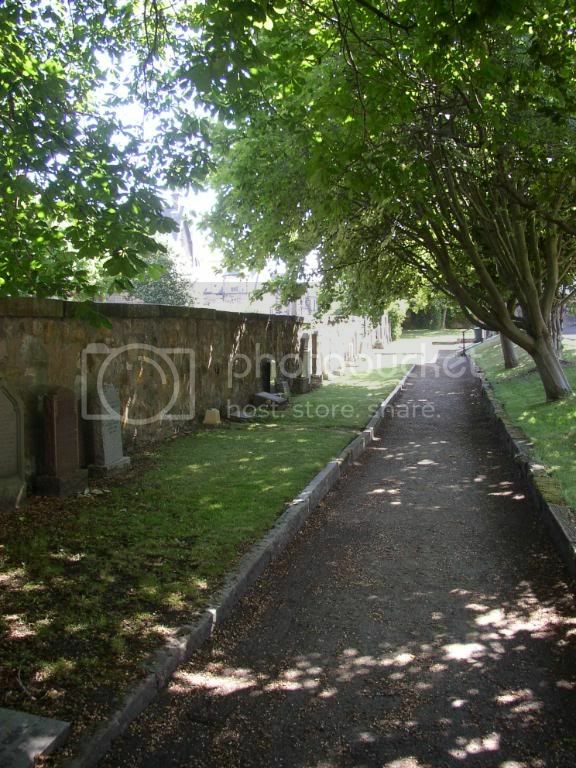 The consequent shortage of available lairs resulted in plans to remove the trees in the side borders in front of the church so as to use the ground for burials. 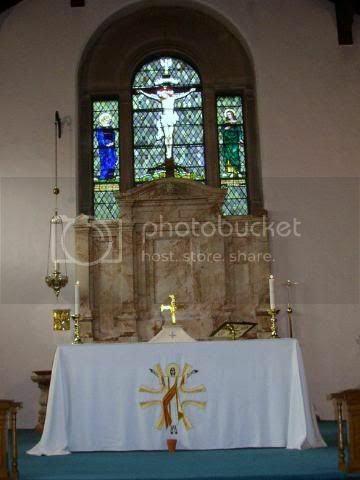 Further problems arose at the end of the nineteenth century when the chancel was added to the church. The unusual construction, which can be seen today, arose from the need to span the structure over occupied lairs beneath. The burial ground continues to be used to this day. The real interest of the burial grounds is the record of past lives that it provides. In the early eighteenth century there was a large influx of military and naval officers into Portobello. Many of them were Episcopalians and St Mark’s soon became favoured by them. This is reflected in the high occurrence of early momuments dedicated to officers and their families. Of particular note is the memorial in front of the church entrance to Lieut Col Halyburton himself, late of the 7th Royal Fusiliers. More poignant is the recent renewed memorial to Joseph Huey MD Assistant Surgeon, 14th Kings Light Dragoons, erected by his brother officers as a mark of their esteem and regard. 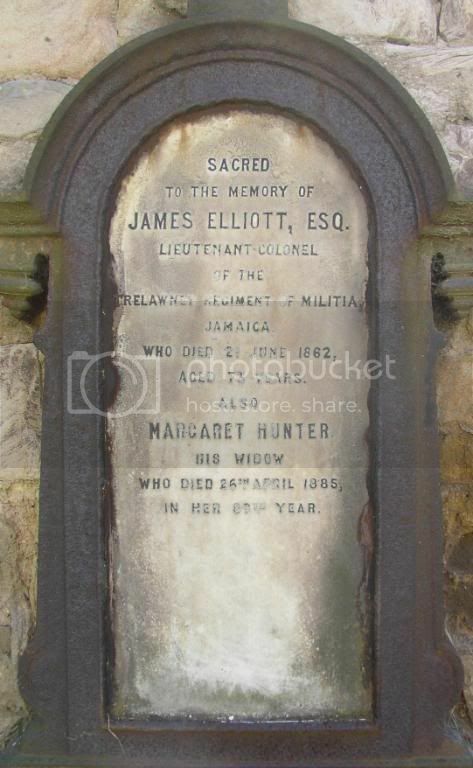 Additional Info: Son of the late Francis and Henrietta Tranter, husband of Catherine Tranter of 45 Tower Street, Portobello, Mid Lothian. Native of Wellington, Salop. Memorial: Noyon New British Cemetery, France. Family Grave: Situated along the wall on Left side of church. 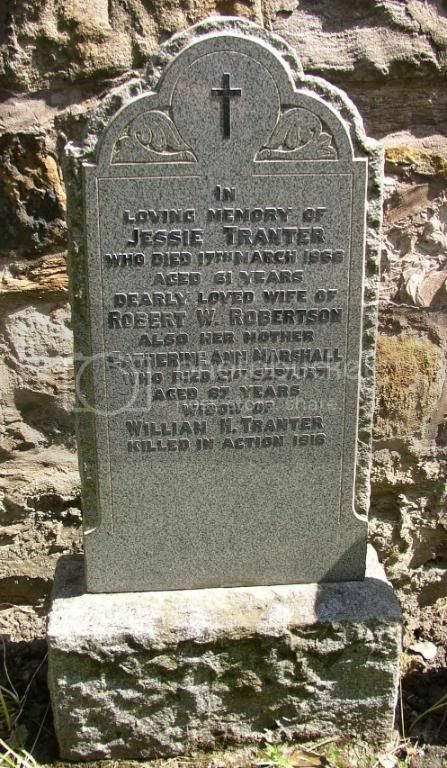 In loving memory of Jessie Tranter who died 17th March 1968 aged 61 years dearly loved wife of Robert W Robertson, also her mother Catherine Ann Marshall who died 21st Sept 1971 aged 87 years, widow of William H Tranter killed in action 1918. Memorial: Portobello (St Mark’s) Episcoplalian Churchyard. CWGC Grave: Situated along the wall on Left side of church. 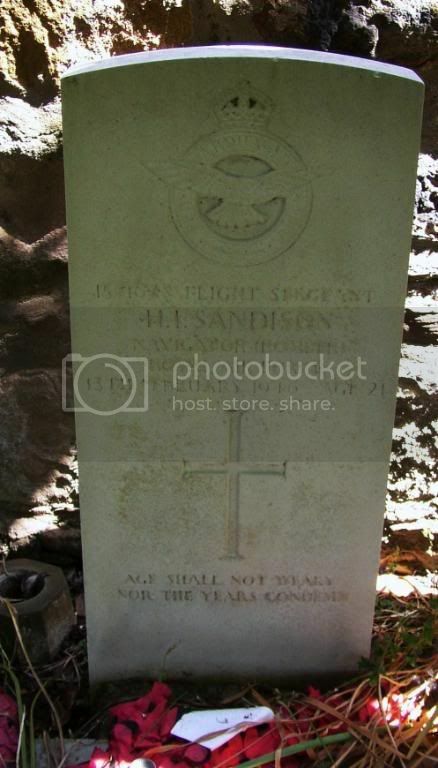 1571678 Flight Sergeant H I Sandison, Navigator (Bomber) Royal Air Force, 13th February 1946, age 21. Age shall not weary, Nor the years condemn. 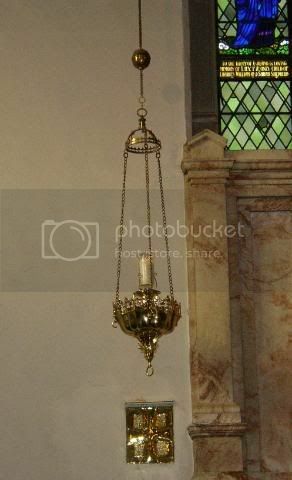 The sanctuary lamp within the chapel was dedicated to Flight Sgt Sandison and his crew who were all killed during a flying accident. 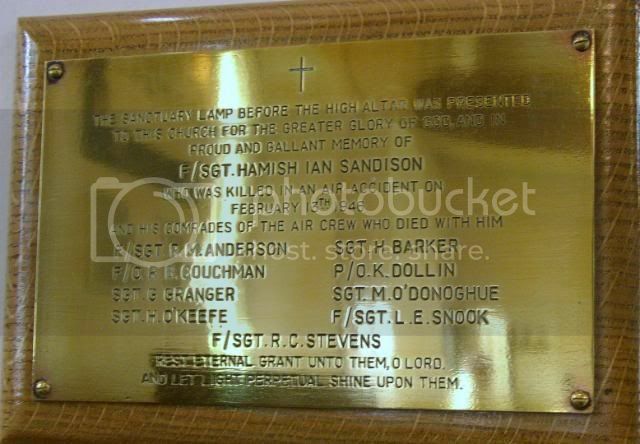 I wouldn't normally have added this here, but since Flight Sgt Sandison is buried in the churchyard just at the side of the chapel, I felt it was appropriate to add the pictures of the commemorative plaque and the lamp to my post. 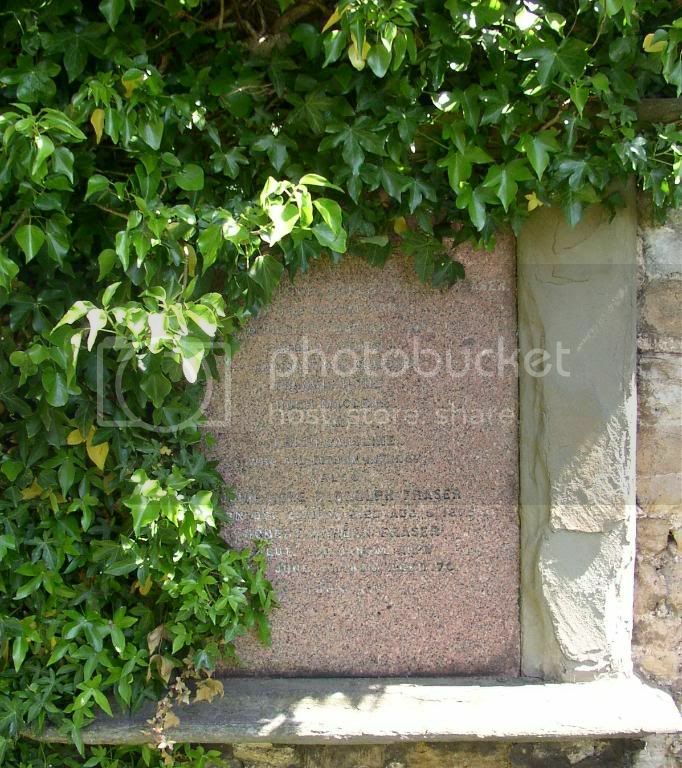 Grave situated on the left wall of the church its self. The top of the cross appears to be missing. 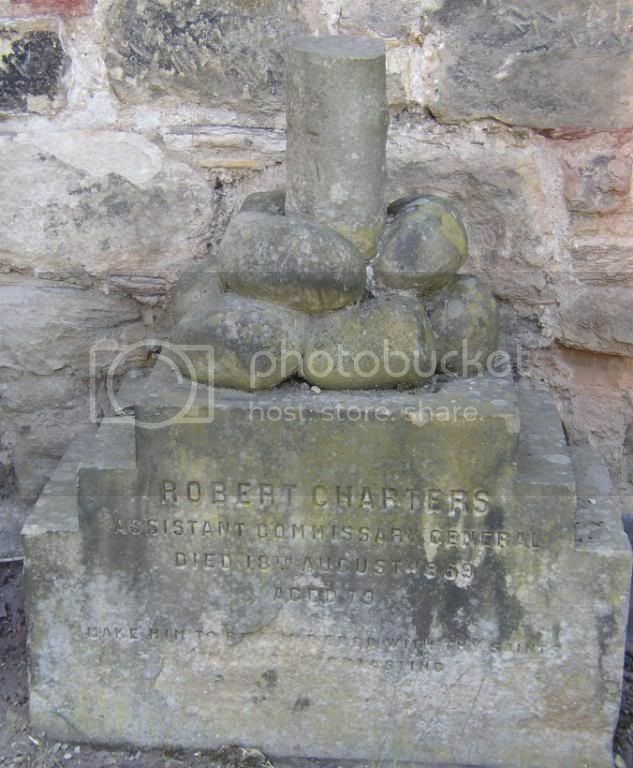 Robert CHARTERS, Assistant Commissary General, died 18th August 1869 aged 79. The grave is situated along the wall on left side of church. In memory of Caroline Purves HOME the beloved wife of Lieutenant Colonel Robert Warden FRASER of the Bengal Army who died 12th February 1868 aged 37 years, and of their children, Francis Home, Hugh McLean and Edith Caroline who all died in infancy, also John Home Biddulph FRASER born December 20th 1857 died August 8th 1875. 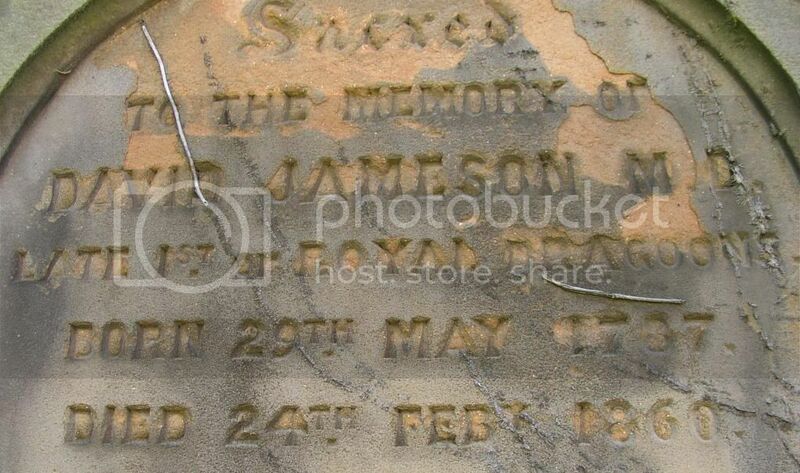 Robert Warden FRASER Lieutenant Colonel Bengal Army died June 30th 1876 aged 70. Family grave stone situated along the wall on left side of church. 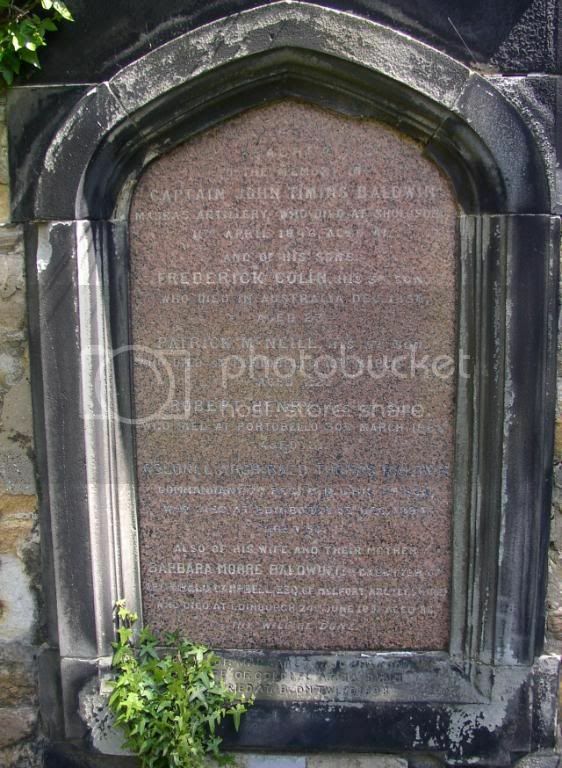 Sacred to the memory of Captain John Timins BALDWIN Madras Artillery who died at Sholopore 11th April 1846 aged 41 and of his sons Frederick Colin, his 3rd son who died in Austrailia December 1856 aged 23, Patrick McNeill, his 5th son who died at Portobello 10th march 1866 aged 22, Robert Henry, his 4th son who died at Portobello 30th March 1866 aged 31, Colonel Archibald Thomas BALDWIN, Commandant 7th M.N.I, his 2nd son, who died at Edinburgh 5th December 1884 aged 53. 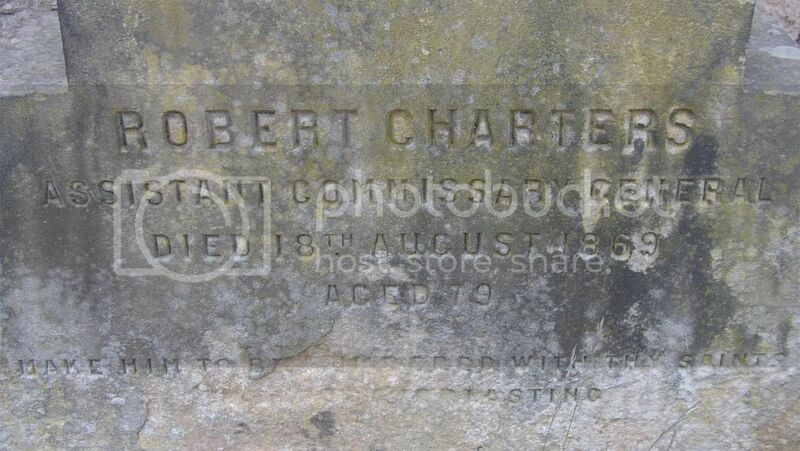 Also of his wife and their mother Barbara Moore BALDWIN (3rd daughter of Archibald CAMPBELL ESQ of Melfort Argyleshire) who died 24th June 1891 aged 86. Thy will be done. Also of Margaret JOHNSTON wife of Colonel A T BALDWIN, Buried at B. On Tweed 1898. 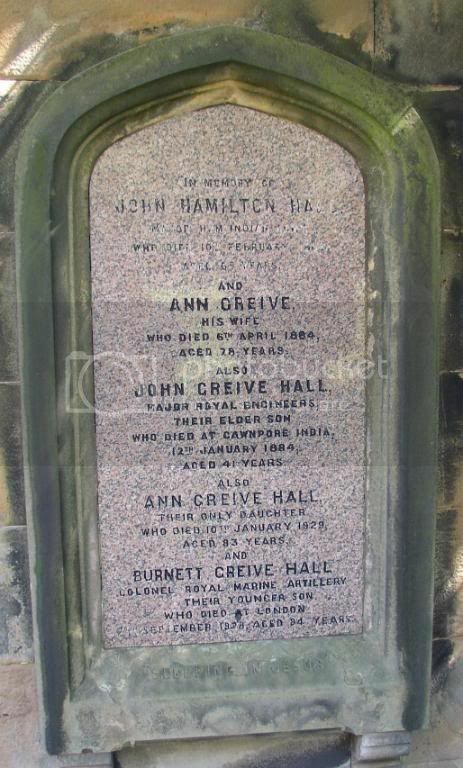 This grave can be found on the watt on left side of church. Sacred to the memory of Charles Robert Farquarson the infant son of Major Thomas D KER Bombay Army born 2nd March 1863 died 16th July 1863. 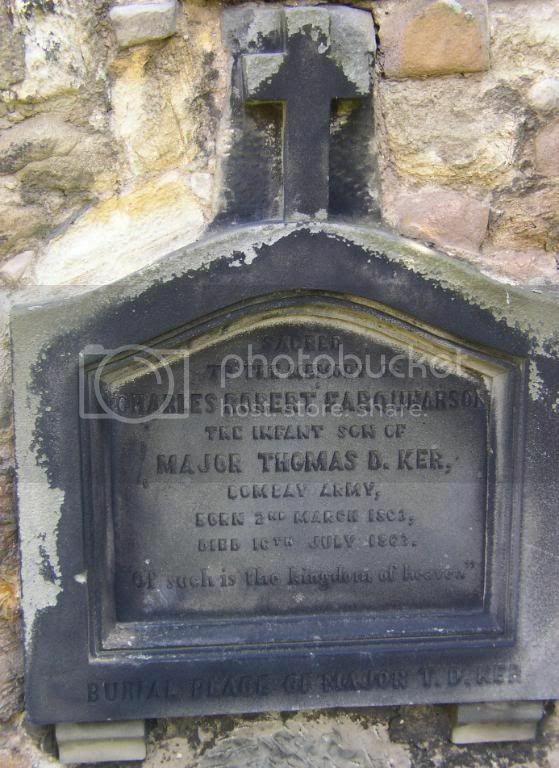 “Of such is the Kingdom of heaven” Burial place of Major T D KER. This family stone can be found on the wall at the back of the church. This stone can be found on wall at the back of church. 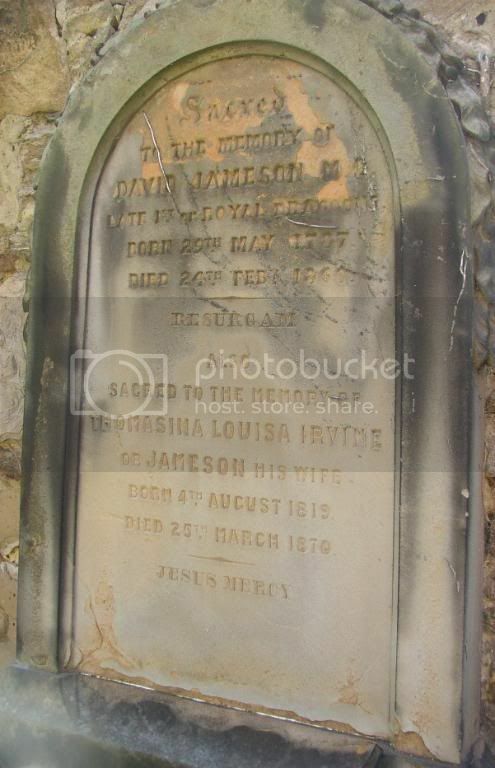 Sacred to the memory of David JAMESON M.D Late of 1st or Royal Dragoons born 29th May 1787 died 24th February 1860, also sacred to the memory of Thomasina Louise IRVINE or JAMESON, his wife born 4th August 1819 died 25th March 1870. 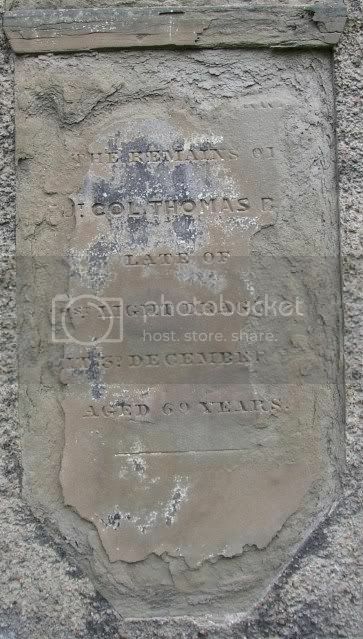 This grave can be found on the back wall behind the church. 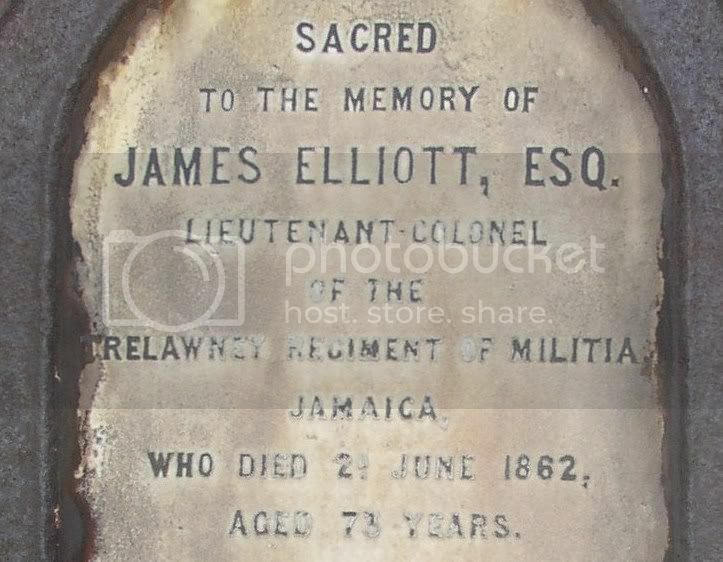 Sacred to the memory of James ELLIOT ESQ, Lieutenant-Colonel of the Trelawney Regiment of Militia Jamaica who died 2nd June 1862 aged 73 years, also Margaret HUNTER his widow who died 26th April 1885 in her 89th year. This stone can be found at the back of the church. 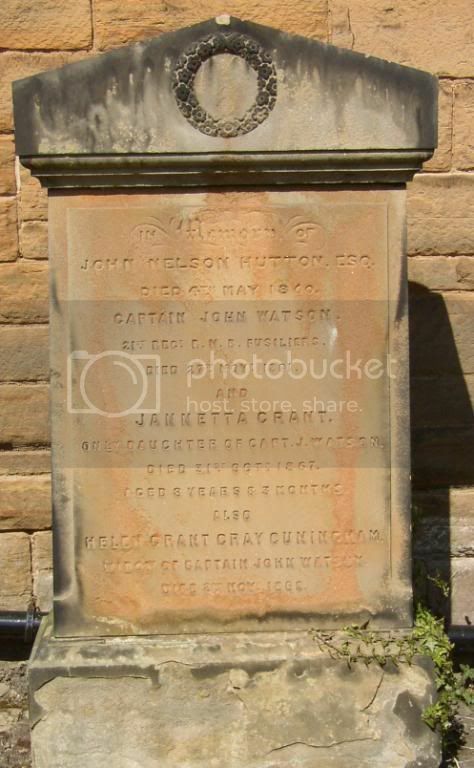 In memory of John Neilson HUTTON ESQ died 4th May 1860. Captain John WATSON 21st Regt R.N.B Fusiliers died 27th November 1861 and Jannetta Grant only daughter of Captain John WATSON died 31st October 1867 aged 8 years and 3 months, also Helen Grant Gray CUNINGHAM widow of Captain John WATSON died 2nd November 1869.
disbanded at Stirling in 1816. This Regiment did not serve in the Peninsula nor at Waterloo, but suffered severely in the Washington and New Orleans campaigns of 1814-1815. They were renamed in 1877 to the Royal Scots Fusiliers. This grave can be found at the rear of the church. Sacred to the memory of Alexander BUCHANAN Lieutenant R.N who died 22nd Nov 1849 aged 56 years and Ann Margaret SHIPPARD his spouse, daughter of Alexander SHIPPARD Rear Admiral RN, who died at Melbourne Austrailia 12th March 1873 aged 70 years and was buried at Geelong, also George William Henry who died 25th April 1841 aged 11 years, also Thomas John Crane who died at Geelong Austrailia 31st January 1864 aged 26 years both sons of the above. 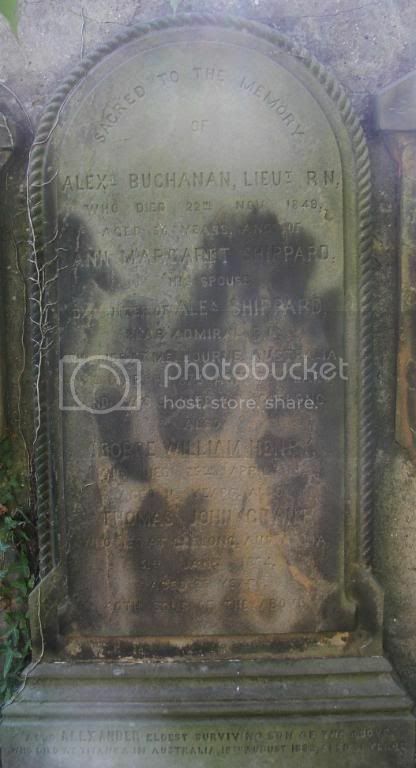 Also Alexander, eldest surviving son of the above who died at Titanga in Austrailia 18th August 1884 aged 51 years. This stone can be found on the wall at the right hand side of the church. There is 3 segments to this stone, the middle one is difficult to read as there is a hole in it! Of course thats the one that is important!! Sacred to the memory of Lieut. Colonel Robert DOUGLAS late..............Regt, last surviving son of the late Colonel DOUGLAS of Strath........dry, died ..........1834. 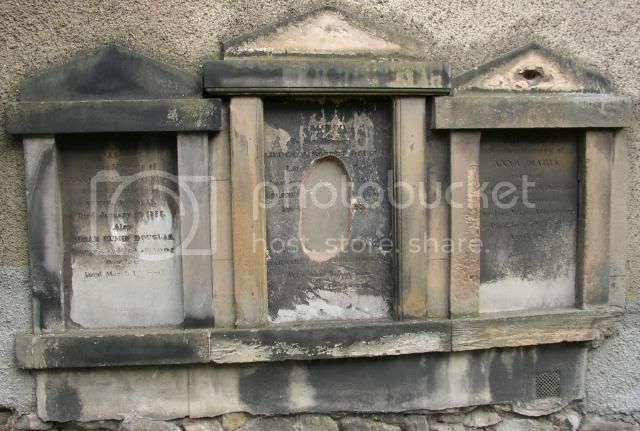 To .............. Margaret Campbell DOUGLAS who went before him August 12th 1834. Sacred to the memory of Anna Maria relict of Lieut. 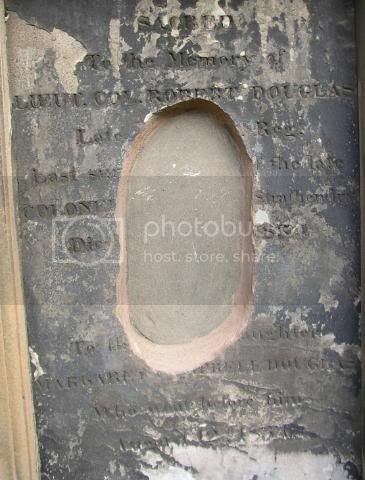 Colonel Robert DOUGLAS and daughter of the Late Major ASHENHURST died July 19th 1836 aged 68. This stone is difficult to read, but life was made so much easier as there is also a commemorative tablet inside the church! The remains of Lieut. 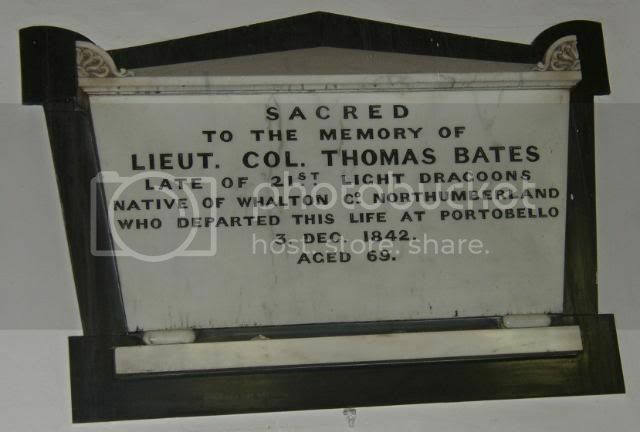 Colonel Thomas B.......... Late of ...........Light Dragoons.............3rd December ........ aged 69 years. This commemorative tablet can be seen on the right hand wall inside the chapel, just to the right of the Roll of Honour for WWI and WWII.